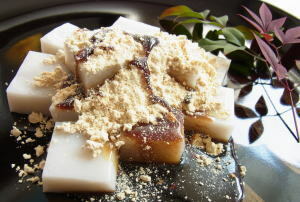 Kuzumochi ('葛餅', is classified into sweets), is known as Arrowroot-starch Dumplings in English, and 葛饼 (Gé bǐng) in Chinese. It is the Japanese style sweets. Arrowroot Starch, Water, Sugar, Salt, Toasted Soybean Flour, Brown Sugar.